It wasn’t until my senior year of high school that these indoor workouts became enjoyable and productive. Word eventually got out between players that our winter workouts were no longer just a waste of time and suddenly our participation numbers grew! The reason for all of this was because one former player who played at the collegiate level volunteered to run our indoor baseball practice. He had productive and exciting drills that actually worked with limited indoor space. I’ve outlined a few of these drills below with the help of Beacon’s own, Kody Parman. Kody was a standout infielder who played collegiate baseball for Edgewood College here in Madison until 2013. He also shared the same frustration as me with his lackluster youth indoor workouts. These drills are meant to give you and your team a starting point for the off season, so get creative! 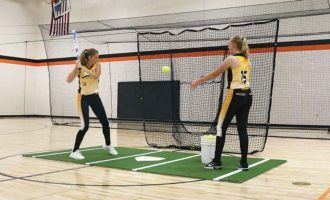 Also, make sure to check out some of the products we offer at Beacon Athletics — such as, the Phantom Indoor Batting Cage – that are specifically designed for teams to get the most out of their indoor baseball practice without breaking the budget. One of the more frustrating parts of warming up in a gym is trying to get your arm loose with limited space. It’s hard for baseball team members to play catch safely without balls ricocheting off of bleachers, walls, and basketball hoops. The best way to get your players arms loose indoors is through stretching. This may seem obvious, but I’ve witnessed many teams get told to go stretch by coaches and then receive zero guidance on what stretches they should be doing. Your team should all be doing the same stretches in unison ensuring everyone is warm. CoachUp.com is a great resource to take advantage of online. Here’s a list of 5 key arm stretches, designed to be a staple that every coach and team should have memorized by the time spring rolls around. 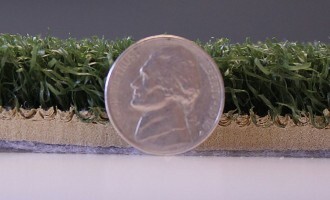 This way, field time will not be wasted teaching warm-ups when diamonds become playable again. This is my personal favorite drill and it can be done a few different ways depending on the coach’s preference and room available. 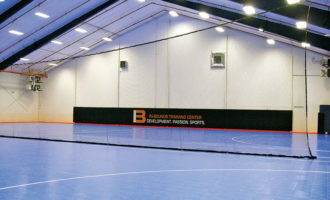 The coach running the drill will line up on the baseline of the gym; players should be lined up out of bounds around mid-court. Each player should have a tennis ball in hand or at least have enough balls available to keep the drill running without delay. On the coach’s command, the player will run directly towards the coach standing in the middle of the baseline and flip them the ball. The player will then continue to loop behind the coach and run at an angle to the corner of the opposite baseline. (I recommend starting the drill at half speed and then working your way up to full) Once the player has created some distance the coach throws the ball over the players shoulder and they will then try and make a play on the ball. After a few rounds you can have the players switch sides of the court to work on looking over their opposite shoulder. Infielders partner up in this drill. I recommend middle infielders work together for added rapport. Partners line up 5-10 ft. away and field balls from each other on the short hop. 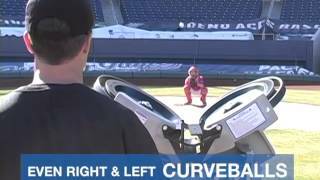 Focus on posture, glove positioning, and judgement on how to secure the ball cleanly based on distances away from the hop and base runner scenarios. Make it a contest to see which group can go longest without an error. Make 2 or 3 lines of players and simply toss the ball randomly in between them. This is a good drill for the younger players to help teach the importance of communication on the field. Make sure they’re yelling “mine” or “got it” and that the other players assume responsibility to get out of the way. This is just a small sample of the many drills you can run to make your indoor baseball practice worth the effort. If you took the time to read this, you should definitely take the time to browse the internet for other ideas and tips specifically for indoor work. 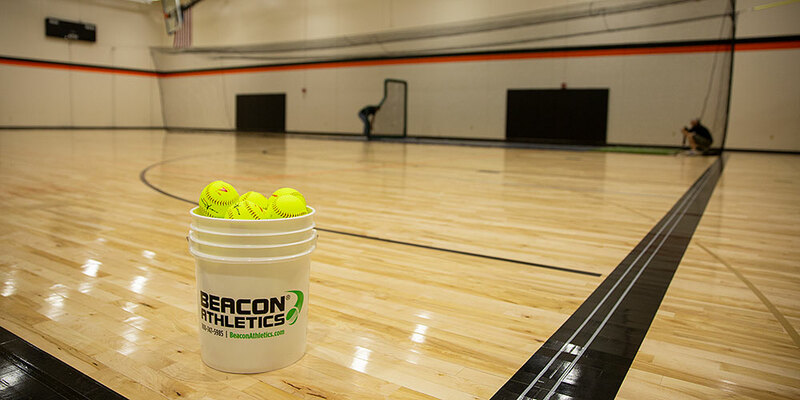 A tool that can definitely help improve productivity during indoor workouts is the Beacon Athletics Phantom Indoor Batting Cage. 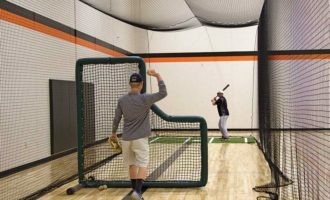 This indoor batting cage was designed specifically for easy set up and take down. It only takes two people less than 5 minutes and when it’s down, there is nothing left hanging from the ceiling. Why mess with expensive and bulky cages that require motors and switches for raising and lowering them? This cage is a fraction of the price with less potential components to fail. It really is simple engineering at its finest and we have not had one complaint about it. Check out the installation video here and take a look at all of our batting cages and batting cage accessories. All are Beacon Built and Made in the USA.